Unlock the power of the Packrat Factions. 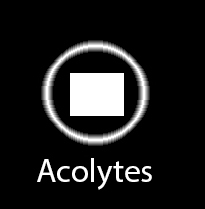 Today we look more closely at The Acolytes. Short Description: You are an elite hacker who has a knack for computers and is always on the cutting edge of information technology. You have a keen eye for strategy and will get things done by any means necessary. History: Acolyte and his 15 members were originally from the Terror Hack where he was second in command to their leader Mage, the head of the cyber terrorist organization. Acolyte is psychic and even though he had an elite position in the Terror Hack he was always skeptical of Mage and his lack of understanding of codess power. After years of being with the Terror Hack, Acolyte wanted to go out on his own and split from Mage taking his people junior and senior with him. With nowhere to go but the desire to keep up their attacks on the Elite government and the Corporation, Acolyte searched for a new home for his team. Taking a psi synch device, NEK hardline terminals, mainframe systems and servers with him, he set out to find a new home for his group. He met up with Faid Callen, who had just newly created the Packrats at the tech and ware nightclub Hack one night and Faid told him about his plan to start a new group of hackers. Acolyte was intrigued and decided to join Faid after learning more about his philosophy and mission. Never looking back Acolyte took his group and joined the Packrats and now leads the most elite group of hackers in the Packrat Sprawl. Acolyte answers to Faid who most of the time lets him set out on his own only ensuring he keeps in line with the Packrat Code. Acolyte follows the Code to the letter and will even question Faid when one of his orders doesn’t seem to align well enough. Acolyte is a brilliant scientist and has worked with DNA based, silicon, and cybernetic technology. He can write programs in his sleep. His latest creation is the Mole System which is used to infiltrate computer systems, it has a port replicator, port sniffing and logging features. His team infitrates the Corporation and steals Top Secret data from them and the SenseNet. There is no system that Acolyte can’t hack. Known for his strategic mind and ever present wit, Acolyte has one tragic flaw – his addiction to the psi inducer drug neurocyne. Having lost his mate pair Sim to a drug overdose, Acolyte about lost it and that is part of the reason he split with the Terror Hack. Wanting to find a home which understood codess power he glommed onto the Packrats willingly and has never looked back. Key Members: Chase, a junior hacker who was elevated to full status in the short story “The Acolytes” from grydscaen: tribute.